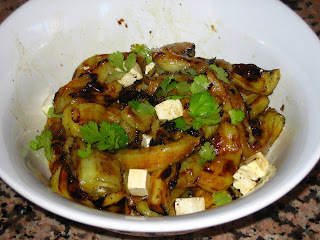 There was so much fresh produce at the San Pedro market last Thursday that I was inspired to do some different dishes over the weekend. I couldn’t resist and bought two punnets of raspberries, celery root, white asparagus, leeks, aubergines, red peppers, fresh basil and mint, cantaloupe and a few nectarines. The nectarines were grilled along with some chicken breast and served over curly lettuce with a pine-nut and Dijon mustard dressing that same evening. 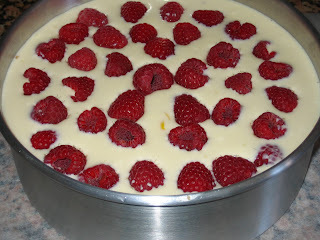 Looking for some more ideas, I skimmed through a few cookbooks this weekend and found a cheesecake recipe for the raspberries in Marie Claire Cooking. This book was written by Australian Donna Hay who was then food editor of Marie Claire magazine. Soon afterwards, Donna Hay went solo and became a famous cookbook author. She even has her own magazine. I have all her cookbooks and flip through them often. The recipes in Marie Claire Cooking are easy to do and have the chic and simple style that have become Donna Hay’s trademark ever since. It’s a great source of ideas for easy-to-do dinners and second only to Nigel Slater as the most-thumbed through cookbooks in my collection. They never fail me. I made the cheesecake this afternoon to leave enough time for it to chill in the fridge. Now, I need to get started on our vegetable dish for tonight. I’m going to roast a few red peppers in the oven until the skin is charred then tip them into a bowl covered with plastic wrap so it steams. Then, I’ll grill a few quartered aubergines then peel the skins off. By this time, the skin of the peppers should be cool enough to peel off as well. I’ll mix the aubergine and the peppers, add a few chunks of Feta cheese, some sliced red onions and cilantro then toss this all with lemon juice and lots of olive oil. Dinner this evening will be grilled pork ribs, the aubergine, pepper and Feta salad and Donna Hay’s Baked Raspberry Cheesecake. Yum. Combine biscuits, almonds and butter and press mixture into the base of a greased 20 cm. spring form cake tin. Refrigerate. To make filling, place cream cheese, ricotta, eggs, sugar, sour cream, lemon rind and juice, and cornstarch mixture in a food processor, and process until smooth. (Alternatively, beat with an electric mixer until the filling is smooth.) Pour mixture over base and sprinkle raspberries. 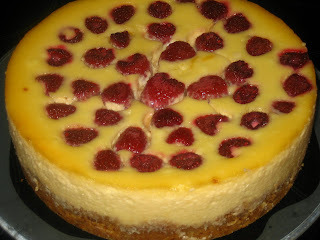 Bake in a preheated oven for 40 minutes or until the cheesecake is just set. Refrigerate until cheesecake is cold and firm. Sorry to hear that your cheesecake didn't work out. I've done this several times and it always turns out fine. Maybe you can try the London Cheesecake recipe from Nigella Lawson? Had this cheesecake in the oven for twice as long as the recipe states and still not set 😦 very disappointed!